What is the Impact of Brexit on Foreign Direct Investment (FDI) within the UK with a Focus on the Manufacturing, Banking and Finance, and Oil and Gas Industries? Master&apos;s Thesis from the year 2017 in the subject Economics - Case Scenarios, grade: 2.1, Sheffield Hallam University, language: English, abstract: Foreign Direct Investment (FDI) has been a complex topic, however its fundamental features have enabled it to shape the world we live in and is the backbone of many countries who would not survive without it. Being part of the European Union (EU), the United Kingdom (UK) was cocooned in a union full of rules and regulations that did not please its residents. The decision to leave the EU was taken and therefore these rules and regulations are not applicable and this in turn will drastically affect FDI. Despite being one of the world&apos;s greatest powerhouse, Brexit offers a great threat to its industries that have had solid foundations within the EU as well as the workforce it holds as the UK holds over 3 million EU nationals. The UK offers an abundance of incentives for investors although these have been affected by 3 the UK&apos;s top industries, Banking and Finance, Oil and Gas and Manufacturing with many companies in these industries agreeing that Brexit will have a negative impact on their business practices even with the government trying to get the best Brexit deal. This dissertation will critically analyse the literature on FDI and how the host country determinates will be used in order to analyse their affect and how it would differ after Brexit. The UK&apos;s attractiveness for FDI was evident in the results that were obtained, which provided a similar theme to variables within the host country determinates that in turn allowed for recommendations to be made on the industries and how future practices could be handled. 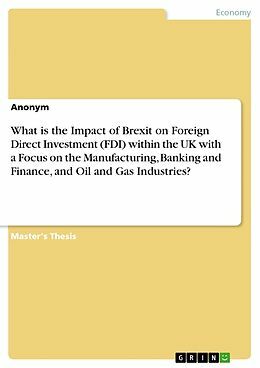 Titre: What is the Impact of Brexit on Foreign Direct Investment (FDI) within the UK with a Focus on the Manufacturing, Banking and Finance, and Oil and Gas Industries?